How Far is Grand Symphony? RCC Framed structured engineering design for Columns, Beams and Slabs. Walls are Used Premium quality bricks (9” Outer walls & 4.5” Inner walls). b)Balconies & Wash areas will be laid with first quality Antiskid Ceramic Tiles. c)Car parking floor will be laid with Eurocon Tiles. d)Stair cases will be provided with Antiskid Tiles. a)Kitchen platform will be fixed with polished Black Granites and stainless steel sink. b)Glazed tiles lay above the platform up to 2’feet of height on the walls. c)Kitchen platform will be 15 feet of length. d)Glazed Tiles up to 7’feet of height for both the Toilet & Bath Room walls. b)Internal door frames white Teak and shutter will be of readymade skin doors. c)Toilet doors will be made of PVC frame with PVC flush shutters. d)Windows fixing, white teak wood frame with glass panel shutter. F)Main door safety grill will be provided. 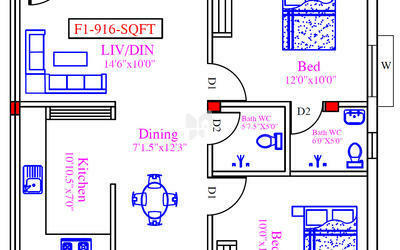 a)Loft Space will be provided in one side of all Bedrooms. Kitchen will have two sides. a)Internal walls and ceiling with Alltech putty with roller finishing. One coat primer and two coat emulsion. (Asian or Nerolac). b)External walls with rough finishing. One coat primer and two coats exterior Emulsion paint(Asian Ace or equivalent). c)Main door will be of polished melamine finishing. d)Doors, windows, shutters and grills. One coat wood primer and two coat Enamel paint (Asian paint or equivalent). e)Three sides of wall color will be half-white and one side of the wall color will be of customer’s choice. Choice should be within the option prescribed by the builder. a)Modular switches of Anchor Roma, and concealed wire of Finolex.or Equivalent will be provided. b)Three phase supply with concealed wiring will be provided. c)Separate meter will be provided for each flat .And the main board will be located outside the flat at the place of our choice. 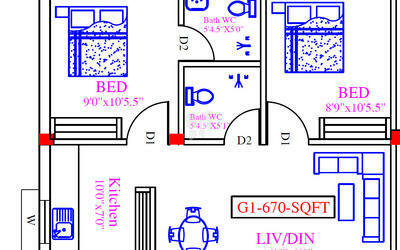 e) Split A/C provision (as per architect’s discretion) will be provided in all bed rooms. 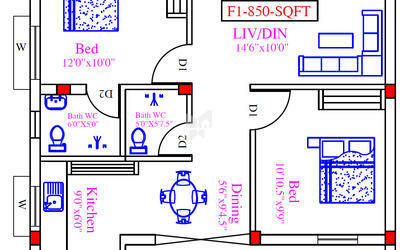 b)Wash basin will be provided Master bath room and dining. a)An overhead tank of required capacity will be provided for both bore well and metro water. b)Bore wells will be provided. The depth will be decided by us based on the yield. c)Sump capacity will be 14000 liters. d)Covered & open car park will be provided at additional cost. e)Brick Masonry compound wall with Grill Gate. Height of 5 feet. f)Weathering course in terrace lime concrete 10’’ X 10’’ .pressed tiles with neatly finished. g)Septic tank with capacity of 12000 liters will be provided. Grand Style Constructions was founded in the year 2008 by Mr S.Elayaraja. It has grown into one of the most respected real estate companies in the industry, reputed for its transparency in all terms of business practices. Grand Paradise one of the Prestigious projects by the builder is planned and developed with Ready to Occupy 2BHK Apartments for sale in Thoraipakkam, OMR, Chennai. 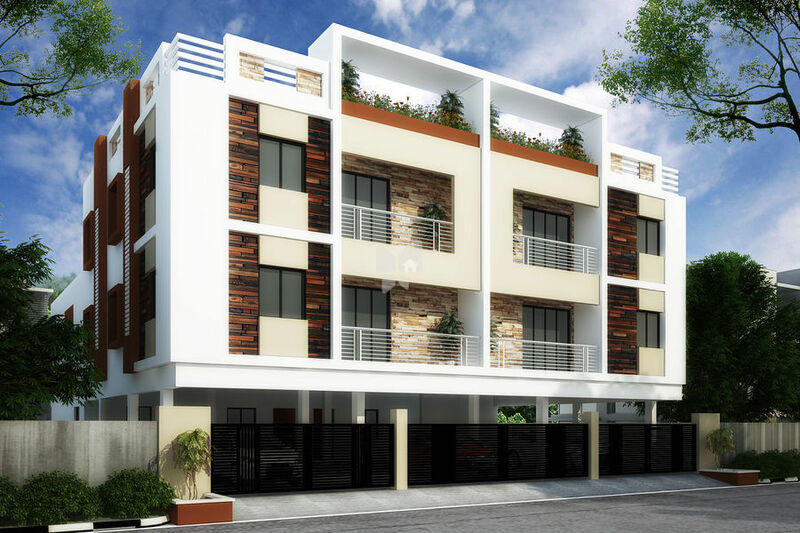 Grand Exotica is developed in a DTCP Approved layout in Chennai, built with Ready to Occupy 2BHK Apartments for sale in Perungudi, OMR, Chennai. Exclusively developed with affordable housing plans to satisfy compact home Seekers, Grand Era and Elita is one of the under construction projects by the builder being developed with well-planned thoughtfully designed 2.5BHK Apartments for sale in Thoraipakkam, OMR, Chennai. 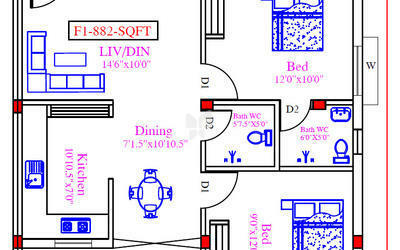 The projects of the builder are uniquely developed to satisfy first time home buyers, affordable housing, budget home projects and compactly planned homes. The portfolio of activities consists of constructing elite homes and residential apartments. Over a decade, the company is armed with metaphors that describe the outstanding relationship with its clients, sustainable quality standards, reliability, hard work, honesty, timely delivery, Planning and involvement. Also, our thinking is to provide excellent after sales service to the customers. It's the wealth of expertise and strong ethical business practices that position Grand Style Constructions among the top pick of elite builders in the city. Grand Style Constructions, with over a decade of experience since its foundation, has built an outstanding recognition for being one of the most reputed construction companies, delivering its clients successful outcomes and high level of satisfaction. Our team of highly skilled and creative employees takes a cohesive, customer - centric approach and transparent approach to all our projects – an approach which has been crucial to our success. Grand style Constructions has set higher standards for itself. At Grand Style Constructions, we strongly believe in implementing the latest technologies backed by an unwavering commitment to the highest levels of workmanship and safety. Strict adherence to Government norms, eco-conscious methodologies, transparent business practices, on-time delivery and expert team of professional assistance are amongst the few essentials to name at Grand Style Constructions that allow you to enjoy an elite lifestyle… hassle- free. Grand style Constructions is committed to build long-term relationships based on integrity, performance, value, and client satisfaction. We will continue to meet the changing needs of our clients with our quality services delivered by the most qualified people. Grand style was formed to meet the needs of the ambitious younger generation with a global exposure. We are passionate about building homes and our brand. We want to take it to even greater heights. We want to be exceptional. We have taken this as our passion and running with it. We are pushing the boundaries, connecting, sharing, learning, creating and doing whatever it takes to be the best in the industry with our customers at the center of everything we do. We move ahead with our vision to be the benchmark in creating fine homes and setting standards. Construction quality will be always par excellence, improvised and modern specifications, timely completion, sustained and focused customer-centric solutions, ethical and professional service and commitment to environmental and community friendly endeavours. Grand style Constructions started operations with the aim of providing modernity, functionality and luxury in each sq. Ft. of construction. Building quality real estate that is maintenance-easy and appreciable in value has been a life-long passion at the Grand style group. This is discernable in the personal touch, and continuous improvement of innovative products and construction solutions that has become the touchstone of excellence that our customers have come to expect from us. Our passion to provide the best possible home for our customers enables us to discover and explore the possibilities that ultimately infuse heart and soul into our projects.